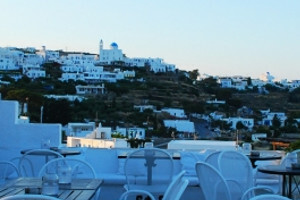 Argo bar is situated at Appolonia the capital of the beautiful Island of Sifnos. 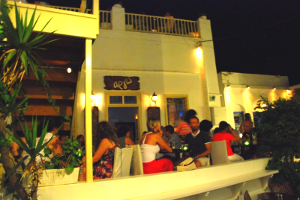 The bar is housed in a traditionally Cycladic architectural-styled monumental building. The building itself is completely refurbished and features nice and spacious internals with a touch of wood and local stone complemented by multi level terraces offering amazing views of the Aegean. Argo bar is open to welcome you from April to late October. Argo bar tunes to a musical variety. You can enjoy our famous cocktails, fresh fruit punches and delicious fruit salads listening to classical music at early afternoon and jazzy tunes at sunset. As the night blends in rock and pop tunes keep you dancing until early morning. Sifnos island is one of a group of 6 small islands forming the Western Cyclades. The appeal of Sifnos, for Greek and foreign visitors alike, is due to its successful retaining of traditional ways of life, its removal from the beaten track of mass-tourism, its turquoise beaches and the historically unspoiled settlements, churches and monasteries found here.